Org-mode is an Emacs mode for keeping notes, maintaining ToDo lists, doing project planning, and authoring with a fast and effective plain-text system. So Org Mode Parser for Nodejs is a parser for reading org-mode files. For more tools, take a look to this specific page on org-mode site! Sorry I did not understand. The example code shows you how to install org-mode-parser via npm. Npm install a node.js package. Keep in mind: org-mode-parser is a node.js library to parse well-formatted org mode files, it is not a emacs extension at all. aha, now I see. 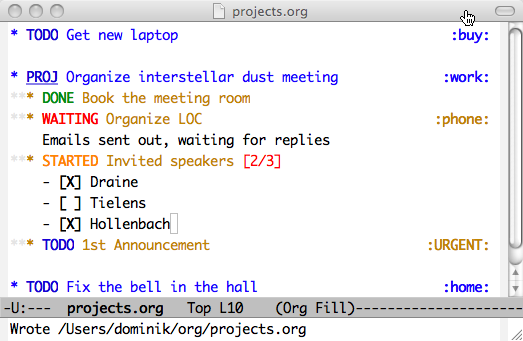 I indeed tried to do something from out of emacs. Just followed the examples and it works like a charm! Is this compatible with browsers? I’m very much a noob with this, but would be interested to know if (and how) this could be used with Visual Studio Code!